NEW YORK (CNNMoney) -- Amazon's third-quarter earnings sharply missed Wall Street estimates, sending shares 17% lower in after-hours trading on Tuesday. Amazon earned $63 million in the quarter that just ended, representing a 73% decline over the same quarter a year earlier. Per-share earnings were 14 cents, far short of the 24 cents per share forecast of the analysts polled by Thomson Reuters. Sales for the quarter that ended Sept. 30 came in at $10.9 billion, which was in line with analysts' estimates. In a post-earnings conference call, Amazon chief financial officer Tom Szkutak said the earnings decline came down to spending on expansion: "We're investing in a lot of capacity. That's what we've been talking about a lot the past few quarters." Amazon is planning to open 17 new warehouses, Szkutak said. The company has also been shelling out cash in other sectors: the new Kindle line, its Web hosting business, digital content and more. Amazon (AMZN, Fortune 500) focused on the positive in its earnings release, talking about last month's unveiling of four new Kindles -- but it didn't provide any specifics beyond the vague statement that Kindle Fire tablet pre-sales have been so strong that Amazon is "building millions more than we'd already planned." Amazon has never revealed sales figures for the Kindle line, which competes with other dedicated e-readers including the Barnes & Noble (BKS, Fortune 500) Nook, the Sony (SNE) Reader and the Kobo, as well as Apple's (AAPL, Fortune 500) multipurpose iPad tablet. The company's "worldwide electronics and other general merchandise" sales, where Kindle is lumped in, rose 59% compared to last year, reaching $6.3 billion. Outlook: Amazon often sets an almost comically wide range for its income forecast, and this time was no exception. Fourth-quarter operating income is expected to come in somewhere between a loss of $200 million and a gain of $250 million. 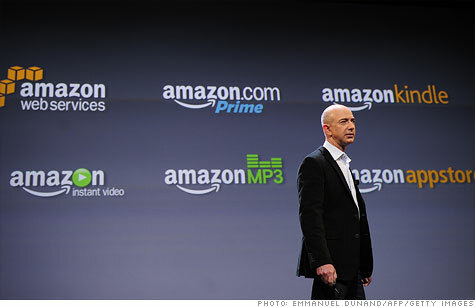 Either way, Amazon is expecting a drop from last year's fourth-quarter operating income of $474 million. Net sales are expected to be between $16.45 billion and $18.65 billion. Analysts had been expecting a range of $16.88 billion and $19.2 billion. Kindle Fire: Amazon's real iPad rival, the Kindle Fire tablet, goes on sale November 15. The $199 device, which was unveiled nearly one month ago, has a 7-inch display and runs on a heavily customized version of Google's (GOOG, Fortune 500) Android operating system. The Kindle Fire offers Wi-Fi connectivity, but no 3G or other cellular connection. It also lacks a camera and microphone, two features found in most rival tablets. Pricing the tablet at just $199 won't net Amazon a wide profit margin, but the company is willing to get tablets into customers' hands for cheap -- and then make money selling them content like e-books, apps, videos and mp3s. Amazon hopes its low price will attract more casual customers who aren't willing to shell out hundreds of dollars for an iPad, Motorola (MMI) Xoom or Samsung Galaxy Tab. Amazon also unveiled a new line of Kindle e-readers during its Fire event, the cheapest of which is a $79 ad-supported entry-level version -- another bargain-basement price that could attract more customers. Orders for the classic e-ink Kindles are double those of the last Kindle launch, Amazon CFO Szkutak said on the analyst call. Of course -- holding fast to Amazon's tradition -- he didn't mention any numbers. Amazon versus Apple? Not so fast.